Corroded or cracked manhole covers at your premises or yard? Weak or worn drain inspection covers posing a H+S risk? Damaged settings around your recessed manhole covers? 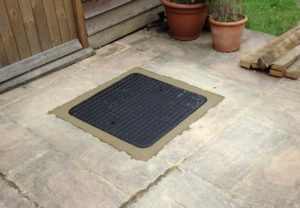 Whatever the issue, Easy Clean Services can replace your broken, damaged or worn manhole covers and inspection cover. We’ll come to your premises, assess the damage, and measure the precise sizes of each replacement lid. We will arrange for replacements in the style and material of your choosing, to the required UK safety standards. If you call our out of hours answerphone, please leave your details. We will return you call on the next working day. At ECS, we manufacture custom, made-to-measure covers in a variety of steel gauges for different loadings. All our custom-made manhole lids are galvanised for durability and weather-resistance. We stock an impressive range of cast iron inspection covers suitable for older or historic premises, where new covers may need to match older ones already on site. Our team can also repair or replace old or damaged brick work, and re-bed the inspection cover frame on a new mortar or concrete bed. Need new manhole covers quickly? Call us today and we’ll aim to be with you within 24 hours.